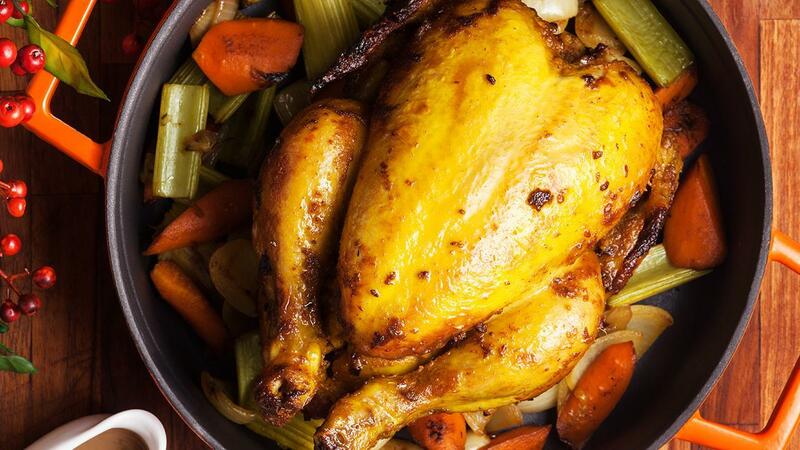 Take your next Sunday roast to a whole new level with this Italian herbs roasted chicken recipe. Indulge in the fresh aromas of herbs and wonderful savouriness of the gravy in this roast that promises to be the centrepiece of your family gathering. Mix Italian Herb Paste with oil in a mixing bowl. Add in chicken and rub/coat the chicken well. Heat up water in sauce pot. Slowly whisk in Chicken Gravy Mix. Bring it to a boil and simmer for 3mins. Fold in butter and Herb Paste Provence and set aside. Heat up a casserole, add in cooking oil. Sweat carrot, onion and celery till light brown. Place marinated chicken in the middle of the pot. Transfer casserole into preheated oven and roast it at 120°C for 40mins. Remove casserole and turn up the oven temp to 200°C. Place casserole back into the oven and roast it further at 200°C for 15mins till golden brown.